Jenny Brockmann’s recent work takes up daily phenomena and cycles that are invisible yet in flux. 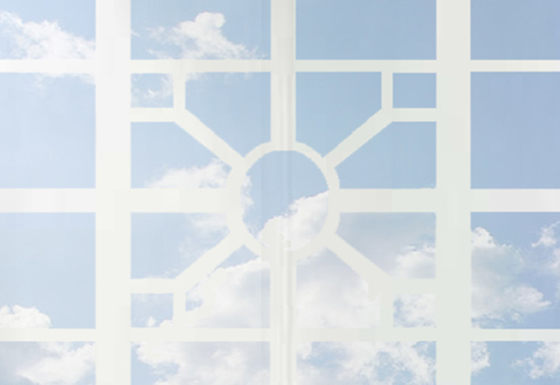 Air, a site-responsive project exhibited in the gallery and mezzanine of the German Consulate in New York brings together two installations and a series of drawings. For example, in Window, 2014, projected window beams create an ever-shifting light synchronized the hours of daylight in Berlin, echoing a site elsewhere. Stone, 2014, also alludes to Berlin, as a configuration of stones shifts in relation to the current temperature there, reflecting distant weather conditions in real time. 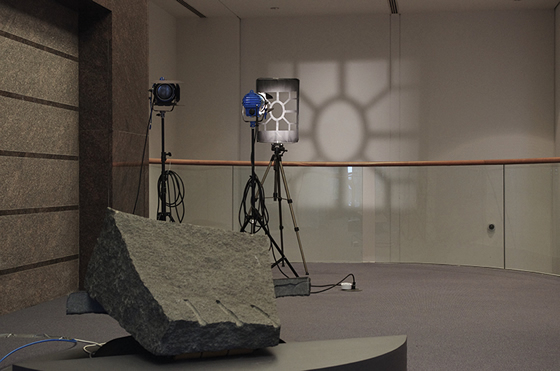 Like the displacement of time (daylight) and representation of remote temperatures, Brockmann’s choice to work with stone quarried from Germany, and transpose it to this other context, expands the frame of references she is working with, from New York today to another moment in time as most of the stone used for building in Berlin now originates from other countries. A series of stippled drawings—Clouds, 2014—further troubles the notion of site-specificity. The drawings are records of observation and memory, drawn in Brockmann’s Berlin studio and at ISCP in New York. Berlin-based artist Jenny Brockmann holds an MFA from the University of Fine Arts Berlin (Meisterschülerin of Rebecca Horn) and an MA in Architecture from the Technical University of Berlin. Jenny Brockmann has exhibited internationally in solo and group exhibitions including Manege, St. Petersburg; Museo de Arte de El Salvador, San Salvador; Nordart, Rendsburg; Kasko, Basel; St. Pancras, London; Gallery Gerken, Berlin; Museo para la Identidad Nacional, Tegucigalpa and Haus am Lützowplatz, Berlin. Curated by Clara Halpern. Ms. Halpern is a curator and writer based in New York. The exhibition is supported by the Berlin Senate Cultural Affairs Department. Opening reception: Thursday, May 8, 2014, from 6:00 p.m. to 8 p.m.